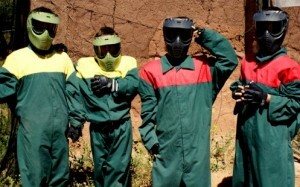 Just outside of Marrakech, we have an idyllic paintball site, perfect for shooting your mates in the back! We organise a range of games to keep you excited and to keep the paintballs flying! Included is your transfers from Marrakech, an english speaking instructor, all safety equipment (including masks, overalls, padded gloves, impact vests, etc) and training. Cost – £50 per person and includes 300 balls, transport from Marrakech and an English speaking instructor.